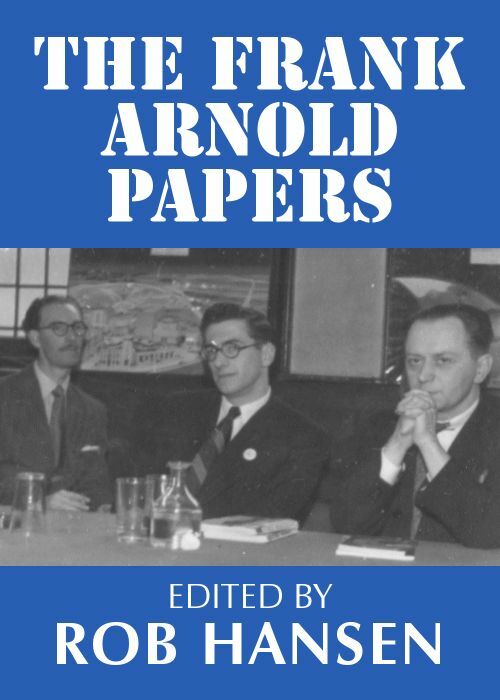 Frank Arnold was a long-time regular of London First Thursday pub meetings from their early days in the 1940s until his death in 1987, and kept the famous Visitors’ Book. Although he published one SF collection, most of his nonfiction never appeared in print. Rob Hansen has compiled, edited and annotated this selection of 30 essays, reviews and memoirs, which also includes an introduction by Michael Moorcock, a historical foreword by Rob Hansen and a personal afterword by Dave Rowe. First published as an Ansible Editions ebook for the TAFF site on 1 December 2017. The cover photograph of (from left to right) Ted Carnell, Ted Tubb and Frank Arnold in 1952 is from the Vince Clarke collection. 44,000 words. Frank’s career as an sf writer was pretty much over by the time we met. I liked him a great deal and respected him considerably so I was glad to republish the fine long essay I included in New Worlds: An Anthology (Fontana/Flamingo, 1983; revised Thunder’s Mouth Press, 2004) because Frank had the scope and knowledge to give me exactly the perspective I felt we needed. It seemed fitting that one of the magazine’s founders should be included in what was intended to be a kind of memorial to my version of New Worlds, remembering that it had originally been founded by fans and professionals pooling their enthusiasm and sustained by amateurs and professionals, just as so much else is achieved in science fiction. Frank was a living corner-stone of New Worlds and his involvement with it was as much part of British science fiction as the magazine itself.